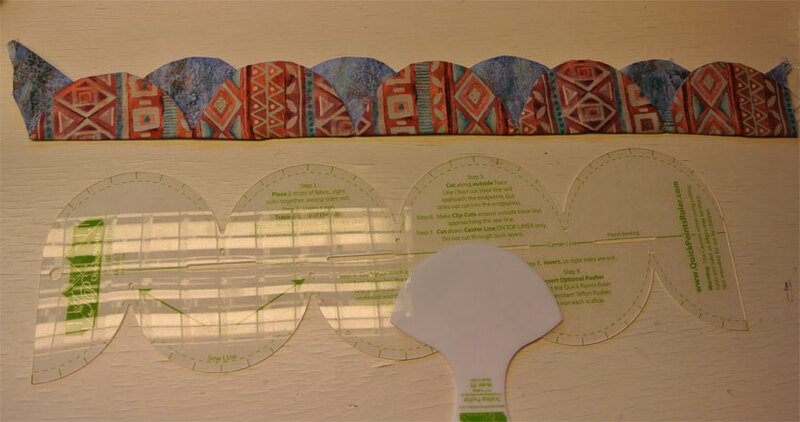 Yesterday my new scallop ruler from Quick point that I ordered from Sewingmachine plus in California. Here I must state that I find it totally strange that some US web stores don’t ship internationally, giving custom and shipping costs as a reason. Then (fortunately) there are the majority who does and why this differs I don’t get. I mean – USPS costs is the same for all and it is up to me as a customer if I find these charges acceptable or not. And customs forms? Don’t take that much intelligence and time to fill them out….. So the 2in scallop ruler and it’s pusher sat in my mail box yesterday and I have tried it out with good result: This is just a try out with fabrics I doubt very much I’m going to do anything substantial with and I didn’t take much care with seamallownaces. But the overall design is great, so great that I start tow toy with the idea of using round the edges of Infinity. That is if I ever manage to figure out how to make them even and how to work the corners. That will come with a ton of ??? Before that – the stars!! I’m putting them of… think I will get the fusibles I got from Beth a try and see what happen to the fraying.